The Supreme Court heard oral argument today in a lawsuit alleging that the Republic of Sudan provided support to the al Qaeda terrorists who bombed the USS Cole in 2000, killing 17 sailors and injuring 42 others. The question before the court was not whether Sudan can be held liable; a federal court has already entered a default judgment of over $300 million against it. 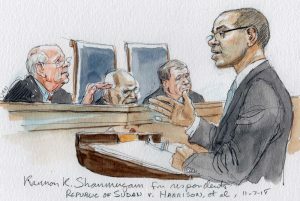 Instead, the justices are considering a threshold question: whether the plaintiffs in the case – the victims and their families – gave the Sudanese government proper notice of their lawsuit when they sent their complaint to the Sudanese embassy in Washington, D.C. After an hour of debate today, the outcome was hard to predict: Although the justices seemed at first to be leaning toward a ruling for Sudan, it was less clear at the end of the argument how they are likely to rule. The plaintiffs in this case sent their complaint to the Sudanese ministry of foreign affairs at Sudan’s embassy in Washington. When Sudan didn’t respond by the deadline, a federal district court in Washington entered the default judgment against it. In the process of trying to enforce that judgment, the case wound up in the U.S. Court of Appeals for the 2nd Circuit, which agreed with the plaintiffs that sending the complaint to the foreign minister at Sudan’s embassy in the United States complied with the FSIA. The complaint did not, the 2nd Circuit ruled, need to be served on the foreign minister at the foreign ministry in Khartoum, Sudan’s capital. Arguing on behalf of the Sudanese government today, attorney Christopher Curran urged the justices to reverse the 2nd Circuit’s decision. The FSIA’s requirement that the complaint be “addressed and dispatched” to the foreign minister means, he said, that it should be sent to the foreign minister at his address in Sudan. If Congress had wanted the complaint to go through an intermediary like the embassy, Curran emphasized, it would have said so specifically, as it did elsewhere in the FSIA. Some justices disagreed with Curran, suggesting that as a practical matter, it would be more efficient and convenient to serve the foreign minister at Sudan’s embassy in the United States. Who knows, Chief Justice John Roberts wondered aloud, how long it would take the complaint to get to the foreign country; the complaint would be “much more likely” to reach the foreign ministry if it were sent to the foreign country’s embassy in the United States. Justice Samuel Alito reiterated this idea, asking Curran whether, when Congress passed the FSIA, it thought that sending a set of documents to Khartoum with a request for a return receipt (another requirement imposed by the FSIA) was simple. Justice Elena Kagan also seemed dubious, telling Curran that the FSIA does not specify that the mailing be sent to the foreign minister “at his own office.” There seems to be, she suggested, something special about embassies that would lend themselves to receiving complaints in lawsuits against a foreign government. Everyone understands, she continued, that embassies are intended to be a foreign government’s point of contact with the country that hosts them. Some of Kagan’s colleagues, however, took a contrary view. 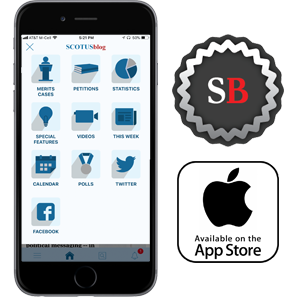 Justice Sonia Sotomayor noted that she had looked at state laws governing the service of complaints and that virtually all states require service where the defendant lives or does business. The idea, she concluded, is that you serve someone where you are likely to find him – which, for a foreign minister, is not normally an embassy overseas. Justice Stephen Breyer posited that service on the foreign ministry, rather than the embassy, was preferable to avoid having the complaint fall through the cracks. The Sudanese embassy in Washington, he pointed out, operates with only minimal staffing: one ambassador and one assistant, along with four American employees working in the mailroom. Who knows what’s going to happen to the complaint if it gets sent to the embassy? Breyer queried. Arguing for the plaintiffs, attorney Kannon Shanmugam echoed Roberts’ suggestion that allowing service by mail at the embassy is perhaps the most reliable method to ensure that the foreign minister actually receives the complaint, which is the concern at the heart of the state laws cited by Sotomayor. Indeed, Shanmugam stressed, when this lawsuit was filed in 2004, it was hard to find someone willing to deliver the complaint to the foreign ministry in Khartoum because the country was consumed by a civil war. In a move that Shanmugam sharply criticized in his briefs, the federal government filed a “friend of the court” brief that sympathized with the plaintiffs in the case but ultimately urged the justices to rule in favor of Sudan. Some justices seemed somewhat perplexed by the government’s filing, with Alito and Justice Brett Kavanaugh asking Assistant to the U.S. Solicitor General Erica Ross to describe how exactly the government would be harmed by a ruling for the plaintiffs. Ross explained that the U.S. government has many embassies, so that it would be problematic to accept complaints at all of them, not to mention the U.S. consulates that could also be affected by the court’s decision. It was not clear that the justices were satisfied with the government’s rationale, but on the other hand Kavanaugh and Justice Neil Gorsuch also seemed to suggest that a ruling against the plaintiffs might, in essence, be the lesser of two evils, because plaintiffs could still serve foreign governments through the U.S. State Department (under another provision of the FSIA) even if service by mail at the foreign ministry proved unsuccessful. Shanmugam’s chances seemed to wane when he acknowledged that he was not aware of any case in which service through the State Department had not worked. But the momentum somehow seemed to shift after Alito asked Shanmugam whether, if the plaintiffs were to lose and had to serve Sudan through the State Department, the Sudanese government would make an appearance in the proceedings. But that response prompted the justices to pepper Curran with questions that boiled down to an inquiry into what Sudan had known about this lawsuit against it, and when it knew it. In other words, had Sudan actually failed to learn about the lawsuit in time, or was it using the service question to try to evade the judgment? Alito seemed to think it was the latter. Had the Sudanese government forgotten about the USS Cole incident, he asked Curran, or did it not know that the litigation was going on? 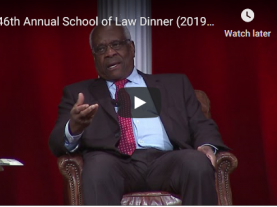 Justice Ruth Bader Ginsburg chimed in: Did Sudan have notice of the lawsuit? Curran confirmed that someone at the Sudanese embassy had known about the lawsuit, although it was less clear whether anyone at the foreign ministry in Khartoum had known about it. When did they know about it, Breyer asked? Curran answered that, as far as he could tell from the record, the embassy employee had known about it after the motion for the default judgment was filed, but before the district court actually entered the default judgment. 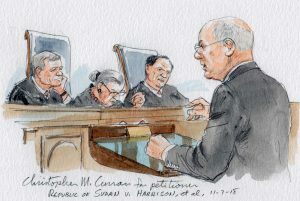 With his time running out, Curran told the justices that the plaintiffs’ proposed rule was “broad and unpredictable” and “leaves too much creativity for plaintiffs and courts.” Five justices may well agree with him, but with the tide seeming to change at the end the case may wind up being much closer than expected. If the argument in the courtroom was largely a dry discussion of legal and practical issues, the scene outside the Supreme Court building after the argument was more emotional. Two service members who were on the ship when it was bombed had come to Washington to watch the argument, and they were joined by the family members of three sailors who were killed in Yemen. Sailors and family members outside the court after argument: From left to right, Rick Harrison, David Morales, Lorrie Triplett, Jamal Gunn (whose brother was killed in the bombing) and David Francis (whose sister was killed). 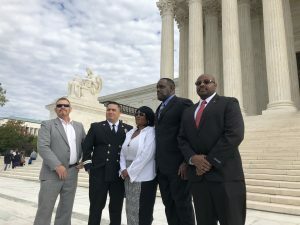 The named plaintiff in the case, Rick Harrison, described how he and his shipmates “spent 19 days fighting for our lives and fighting for the ship.” Harrison suffered a fractured spine, a major concussion, and damage to his knees. Another service member who was on board the Cole, David Morales, emphasized that the lawsuit was not about the money, but instead about accountability. “To see our country” siding with Sudan “is very painful,” he said. Morales carries a piece of the Cole’s hull with him at all times to remember the day. A decision in the case is expected sometime next year.